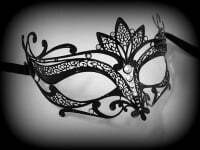 Classy & lavish black filigree ladies mask, very delicate & stunning! One for the person who demands the very best. 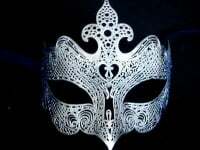 Assured to get yourself noticed for all the right reasons with this genuine Venetian handmade mask - For the woman who demands the best it is fitted with ties for a security and comfort.Be the centre of attention for your fabulous style with this sophisticated Mughetto Filigree Metal Mask without strass (crystals). 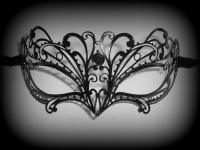 This show stopping filigree mask is a stunning reflection of the new Venetian 'chic contempory attitude', designed in an ultra-fashion-forward nero black gloss finish which makes it a very clean cut & uncluttered look. Make a luxurious fashion statement everywhere you go with this must-have style accessory.